Entering the villa you will find the spacious open plan living and dining area. The large equipped kitchen has all modern conveniences. 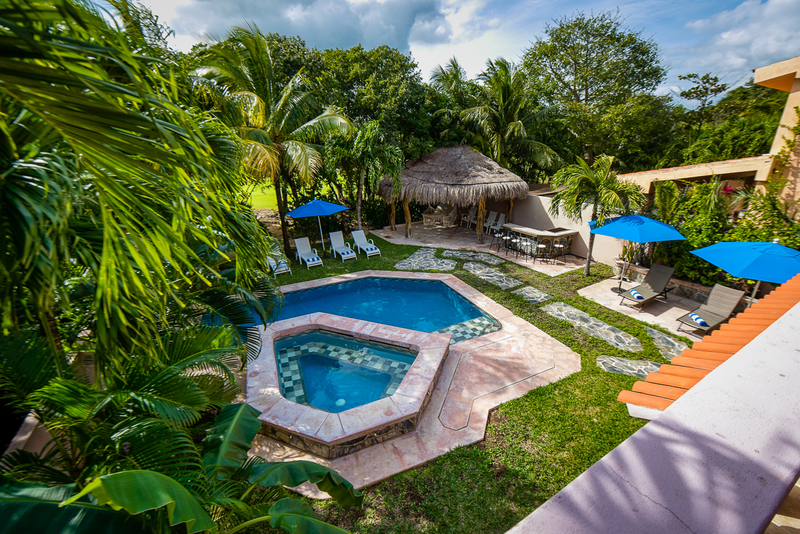 From the living room you have expansive views of the garden complete with swimming pool and unheated tub whirlpool, palapa and BBQ grill, relax on pooolside chaises, enjoy great outdoor living cooking up the ’catch of the day’ on the large charcoal BBQ. Playa del Carmen is 20 km north of Puerto Aventuras. Under 15 minutes south you have Akumal, with beach restaurants, dive stores, Yalku Lagoon. The ruins of Tulum, Coba and the local cenotes (sink holes) are well worth a visit too, Eco Parks, Xcaret and Xel Ha! Villa Yalku offers a great vacation in comfortable and relaxing surroundings. •Private swimming pool and unheated tub whirlpool.